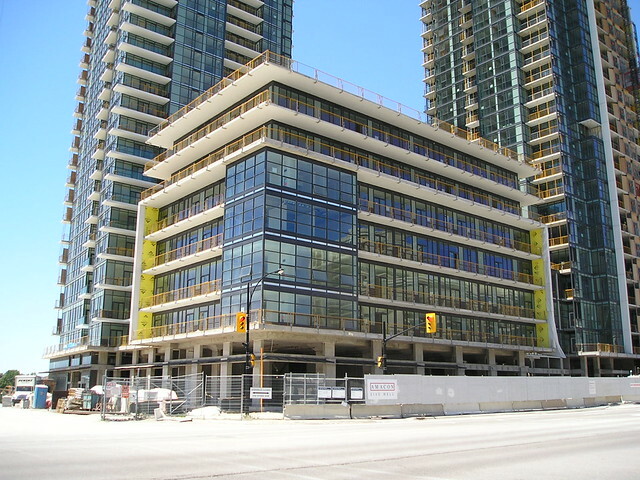 Square One Condos are those that surround the Square One shopping mall in Mississauga. 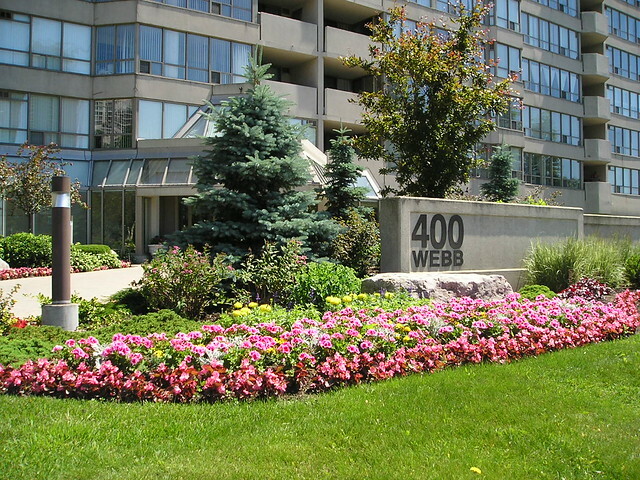 These condominiums first started to appear on streets such as Webb Drive and Kaneff Crescent in the late 1980’s, and I think it is safe to say that, at that time, no one in their wildest dreams would have imagined the change in lifestyle preference, and the change in the City of Mississauga, which would take place in ensuing years. Today, you will find hundreds of Mississauga condos for sale near Square One, and many more for lease, in all price ranges. Highrise condo living has become the preferred housing choice for buyers of all types: first time buyers, empty nesters, recent immigrants to Canada, and investors in the Mississauga Square One area. As more and more people purchase Square One condos in the city centre of Mississauga, all signs point to this trend continuing. 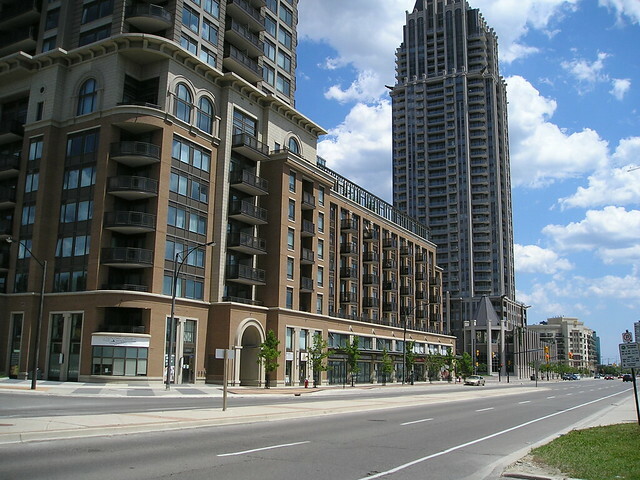 Mississauga condos near Square One today constitute what is perhaps the greatest concentration of high rise condominiums of any suburb in North America. Many visitors arriving at Pearson Airport see the Mississauga skyline and assume that it must be Toronto – imagine their surprise when told that this is a suburban skyline, and that the major metropolitan area of Toronto is actually in the opposite direction! There has been an avalanche of new condo development in and around Square One over the past 10 years, building upon the first wave, which produced an already impressive existing group of highrise properties that were built in the late 1980’s and early 1990’s. Living near Square One has obvious benefits: close proximity to shopping, restaurants, Starbucks, hotels, central library, public transit including the Mississauga main bus terminal, the Sheridan College campus, Celebration Square, and much more. In spite of being located in a suburb, the walkability scores of many of the Square One condos rank very highly. 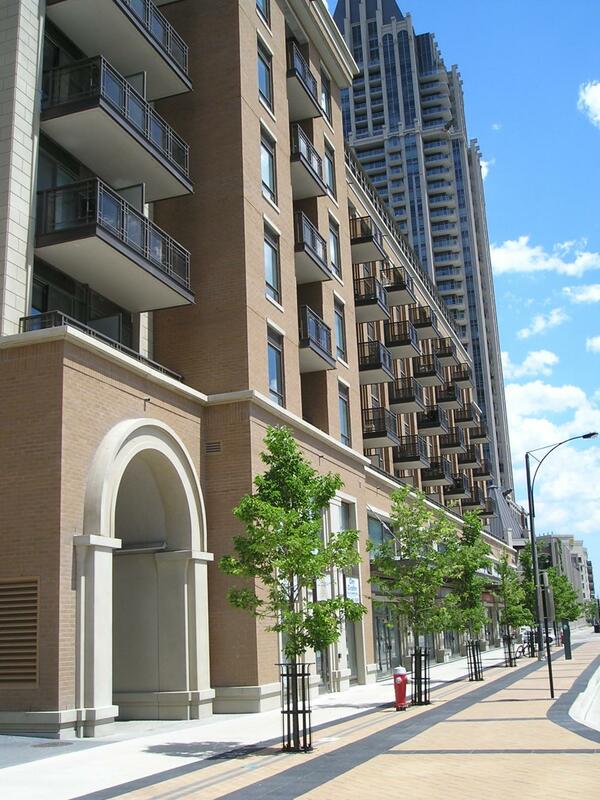 Everywhere in the GTA, and in Mississauga in particular, people have embraced the lifestyle of condominium living. But not all condos are created equal – many have features which appeal to some, and not to others. There are starter condos that are ideal for the first time buyer, and luxury condos for sale that offer unrivaled lifestyles. It pays to know the various projects, and a good agent will know right away which ones will be a good fit for you, and which ones to avoid. As a Square One condo realtor, I have watched this area grow, in an amazingly short time. I have helped many people to buy, sell, and rent condos in the Square One area, and it’s been very gratifying to see people enjoying the condo lifestyle here… So knowing that there are differences between the various projects, and comparing the information on each, which is the best condo for you? The original Square One condos were completed in the 1980’s to the 2000’s, and typically have floor plans that are larger in square footage than today’s offerings. Although the amenities may not be as elaborate as the latest condos, the value is there in the size of the units. Even though these Mississauga condos have been around for some time, when they come up for sale, on the MLS, they often sell quickly. The maintenance fees are usually no higher than the newer condos. 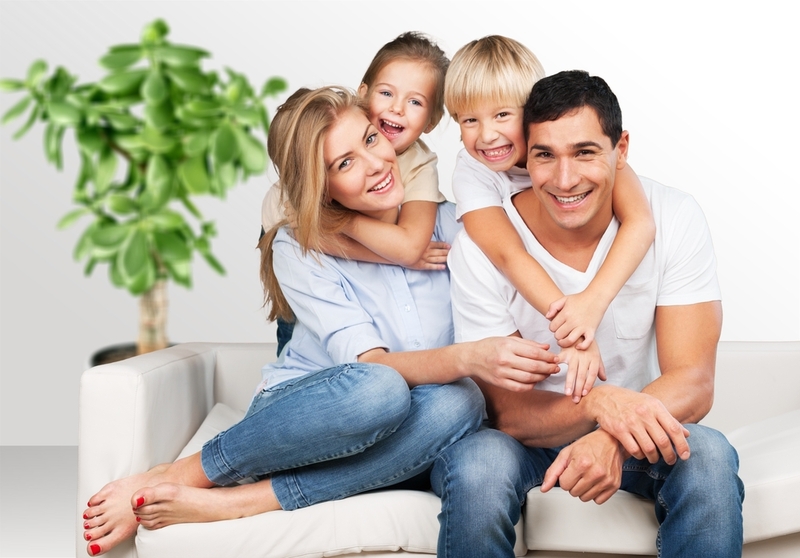 And because the living space is large, these condominiums are often the best choice for families. Many of these are large two and even three bedroom condos, and they can be found both for sale, and for rent. These newer projects are the best of the recent wave of new construction condos which have appeared since 2000. Although the square footage of recent condos is often smaller than those completed prior to 2000, their floorplans typically maximize use of space, and their condo amenities are often very elaborate, offering everything from rock climbing walls, to bowling alleys. Many of these top luxury Square One condos offer high-end penthouses and a lifestyle that truly approaches that of the “rich and famous”. Citygate 1 3939 Duke of York Blvd. Citygate 2 220 Burnhamthorpe Rd. W.
Tridel Ovation 3880 Duke of York Blvd. Ovation 2 3888 Duke of York Blvd. Grand Ovation 310 Burnhamthorpe Rd. W.
Ultra Ovation 330 Burnhamthorpe Rd. W.
One Park Tower 388 Prince of Wales Dr.
Chicago 385 Prince of Wales Dr. Limelight South Tower 365 Prince of Wales Dr. Limelight North Tower 360 Square One Dr.
Absolute 1 70 Absolute Ave.
Absolute 2 80 Absolute Ave.
Absolute 3 90 Absolute Ave.
Absolute World 1 (“Marilyn Monroe” building) 60 Absolute Ave.
Absolute World 2 (2nd “Marilyn Monroe” building) 50 Absolute Ave.
Capital Towers 4080 Living Arts Dr.
Capital Towers 4090 Living Arts Dr.
Eden Park 3504 Hurontario St.
One of the best investment strategies has been to buy pre construction condos in Mississauga. Construction time allows you to make a small deposit, and hold the investment as prices rise. If you are interested in pre construction, brand new condos in Mississauga, we work closely with a number of local condo developers such as Amacon, Tridel, and Daniels, so that when hot new developments are announced, you can get in early to VIP buyer events – this can save you thousands of dollars from what the general public has to pay. Check out Arc Condos by Daniels Erin Mills – the hottest new release this year! So which is the right condo for you? A very important question, after all, you don’t want to pick the wrong building, and find yourself unhappy, and wanting to get out after a short time! Worse, if you really feel unhappy with your new purchase, or rental, you can lose money if you need to move right away. If making the right choice is important, having insider information from people who know the area is essential! By speaking with experts who really know what goes on in each building, you will make the right buying or renting decision. If you knew the answers to the following questions, would it help you to pick the right building? what are the most recent sales prices in the condo? which buildings have the lowest maintenance fees and taxes? What sort of amenities do the individual projects have, and do they fit your lifestyle? Are there balconies, and are they big enough to enjoy? What are the condos at Square One with the best views? How close is shopping? grocery store? doctor’s office? dentist? Which buildings have generous parking facilities for your guests? How old or young are the majority of residents? Will you feel at home here? The answer is, of course, if you had all this inside information, it would help you to make the right choices! Attention Square One Buyers! Want to “Supercharge” your Search Efforts? We’re offering free expert help for you! You can get an expert who will help you and your family to find that perfect condo match! That’s right! Just click the link below to get your free expert help! Claim your Free Expert Help in Mississauga, ON!